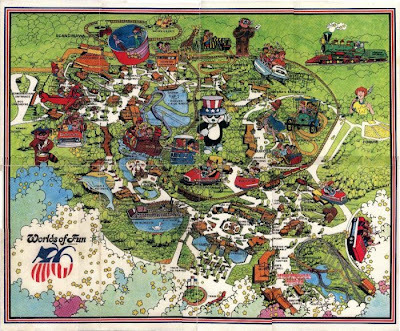 It's always about this time of year I start to think about the coming of spring, and I can't help but remember how much I used to anticipate the opening of Worlds of Fun, a world-class theme park in Kansas City, where I worked off and on from age 16 until the age of 21. I used to work as a photographer at a shop called Spittin' Image, one of those instant tin-type joints where customers dressed up in old-time clothes and had their pictures taken. Spittin' Image was atop the glorious Cotton Blossom docked in a lake with bright blue-green water right at the front of the park. You can see it in the map, here, just to the left of the park entrance where there appears to be a larger-than-life duck swimming next to it. In fact, you could see the stately Cotton Blossom the way from the highway -- the same grande dame whose exterior appears in the 1951 film Show Boat. How I loved dressing people up, and I had my lines down: "Ladies, you can be a saloon girl, a southern belle or a bride. Gents, a Civil War officer, a gamble or a cowboy?" I spent my summers at Worlds of Fun, hanging out with the workers at the Paddle Wheel Cafe, hiding out in the cool confines of the Cotton Blossom Gift Shop on the lower deck when there were no customers and it was scorching hot upstairs, and sneaking off to catch a show at The Tivoli theater or ride The Scream Roller. Sadly, I've learned that the Cotton Blossom is gone. Instead of saving her-- I remember she was in a rickety state the last time I saw her in the late 1980s -- she was torn down in 1995 to make room for another attraction. I can still hear the ragtime music that played in a loop over the loud speaker, and the screams of riders on the nearby Orient Express, which at the time was the world's largest steel roller coaster -- also gone. The park is still there, although somewhat stripped of its original charm, but the nearby water tower is still painted with the hot-air-balloon colors of Worlds of Fun, just as I remember it was all the way back when the park opened in the early 1970s. The Housing Works Book of Decorating with Thrift Shop Treasures Flea Market Objects, and Vintag Details. Pre-order now on Amazon, Barnes & Noble and Borders. These greeting cards from Historic Williamsburg (the one in Virginia, NOT Brooklyn!) area absolutely charming. I found them from a vendor at the Brooklyn Flea's Pop-Up market the other day as I was just about to give up on finding anything that piqued my interest, or fit into my budget. One set features authentic settings of people gathered, either in the middle of a chore or enjoying a meal, all in period outfits, of course. And then there's another box of authentic recipes to re-create over a woodburning fireplace and a cast-iron kettle. Clearly the person who purchased these back in the 1960s loved them so much that she couldn't bear to break up a set by actually using them, since all three boxes have their cards and envelopes in tact. 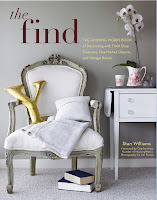 In May, Clarkson Potter will publish my book, The Find: The Housing Works Book of Decorating with Thrift Shop Treasures, Flea Market Objects, and Vintage Details. Pre-order now on Amazon, Barnes & Noble and Borders.